The Doors - that is to say, keyboardist Ray Manzarek and guitarist Robby Krieger - have picked Steelheart singer Miljenko Matijevic to be their new Jim Morrison for an upcoming US tour. Before recruiting Matijevic, the duo toured with Ian Astbury of The Cult and Brett Scallions of Fuel as fill-ins for the late Morrison. Nonetheless, Manzarek and Krieger remain excited about hitting the road. "There's always a big audience out there to dig it," Manzarek tells Gibson.com. "You throw the energy out to the people and the people throw that energy back to you. You create that circle of power. I'm life or I'm some other substance." 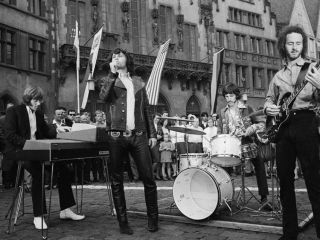 Every few years it seems as though The Doors experience new waves of popularity, and in 2010 the phenomenon continues thanks to a recently released documentary, When You're Strange, directed by Tom DiCillo and narrated by Johnny Depp. The film mixes classic performances of some of the group's biggest hits as well as previously unseen archival footage.